Our outdoor wooden dog signs collection offers a variety of merchandise that is sure to please all dog lovers. 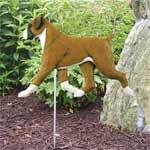 Our signs and dog weathervanes are all hand produced, hand painted, molded from an original wood carving, and made in the USA. 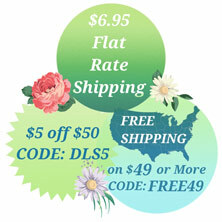 Whether you are looking to spend a lot of money, or a little, there is something for everyone. 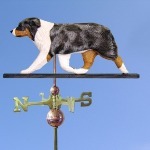 If you are looking to really impress, our dog weathervanes are 100% hand carved, painted, and produced. They are made of high quality bass wood and are truly an epic gift that exudes perfection. We offer two types of outdoor wooden dog signs. Both styles are available with a resin mold from an original hand carving of your dog breed and hand painted. The difference is you can order the sign with or without a welcome greeting. Each welcome sign can be customized to include anything you’d like. You can put a business name, your dog’s name, the dates of your dog and use it as a grave stone, the possibilities are endless! Both styles are weatherproofed and can handle any type of weather, even the nastiest nor’easters! Your outdoor sign will come with instructions on how to maintain the sign to keep it protected year round. Between all 6 categories, we offer over 180 breeds and colors that will accommodate just about every dog owner! So do yourself a favor and browse each category, you won’t be disappointed!